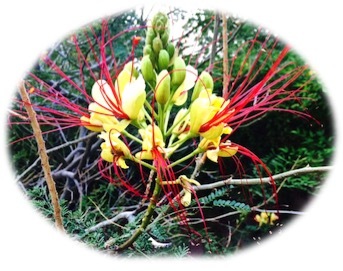 As I walked through my back yard this morning, meditating, and enjoying the lovely Springtime blooms, I came across the tree bearing this colorful flower. I stopped a moment to take in its unique and sort of wild beauty. While studying it, I couldn’t help draw a parallel of this flower’s half bloomed, unique beauty, to the partially bloomed beauty of our lives. This last month I’ve been doing a group study about letting go of worldly definitions of beauty and feeling free to be the beautiful, wonderfully made individuals God intended us to be. Looking at this beautiful, sort of exotic looking flower this morning, I thought, “this flower represents every one of us – such unique, vibrant qualities, and still in the process of blooming!” But oh my, how beautiful are the budding characteristics! The already bloomed parts that make this unique flower so special, which are weathering Spring’s wind and rain, yet standing out strong – are like the unique and special qualities in each of us that have born the tests and trials which have molded us into the beauties we are today. Yet, this special flower has not yet fully bloomed, we can’t yet see the full exquisite beauty this half-bloomed flower promises. Oh – but promise it does!! Just as our own half-lived lives promise! And notice something else – the little green closed buds in the middle of the flower that have not opened yet – do you see how pretty they are? How they work together with the rest of the flower’s design and add to the special beauty of the overall bloom? Wow – how exciting to me to think that this is how I am – how each of us are – we are each a very special, beautiful, blooming work in progress! Yes, you boys and men too! Just as God created this amazing, uniquely special, beautiful flower that blooms in stages, so has He made each one of us! Each stage of our lives, we have learned and brought forth a beautiful, unique, new quality that defines us. By the time we are adults, (like this flower) our outer shell is mostly formed, in all its stunning glory! But there is yet wisdom to be learned, beauty to unfold and bloom, in our hearts, and throughout our lives as God directs us through our life paths, our challenges, our loves and losses, our joys and sorrows. And as we purpose to serve Him! So, as we go through our week, let’s all remember this beautifully unique, half bloomed flower, and the promise of exotic, perfect beauty it holds to come. Then let’s apply this to our own selves; we each are this beautiful and unique flower, which under God’s perfect hand, will over our lifetimes, grow and bloom and perfect into an exotic, perfect creation, meant to live out the unique purpose He individually chose for each of us and which will please Him! Our differences, our trials, our mistakes – they will all work together to grow us and refine us into these gorgeous creations and purposes that God intended. Now, go look in the mirror and see how uniquely beautiful you are! And just think – like this spectacular flower – God’s not done with you yet! This entry was posted in Daily Devotional, Daily Living, Faith, Grace, Inspiration, Lifestyle, Spirituality and tagged Christianity, Comfort, Daily Devotion, Daily Living, Faith, inspiration, Lifestyle, Make a Difference, Spirituality by WordwithMindy. Bookmark the permalink. Love it, Mindy! Going to put this on my Twitter feed scheduler to tweet it in a few hours! LOVE your heart of encouragement!